Tahoe Fracture & Orthopedic Medical Clinic is proud to offer open MRI (magnetic resonance imaging) scans to residents of the Reno, Nevada, area. This innovative open MRI technology helps our team to diagnose and rule out various orthopedic conditions in a much more comfortable setting as compared to traditional closed MRI equipment. Arthritis — An MRI can help the orthopedists at our Reno, NV, office diagnose arthritis because the scan will show whether there is any damage to the cartilage or soft tissues around the joint at issue. The MRI will also demonstrate whether there is any swelling or inflammation near the joint. Spinal stenosis — Spinal stenosis occurs when the spinal canal narrows and exerts pressure on the spinal cord and nerve roots within. Our orthopedists can use an MRI to diagnose this condition if the scan shows narrowing or inflammation in the spinal canal. 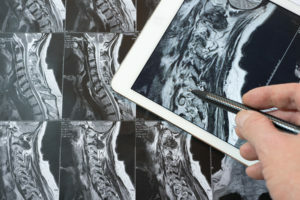 The scan can also display whether there are any bulging or herniated discs in the spine. Broken bones — If our orthopedists suspect that a patient has sustained a broken bone, they may order an X-ray of the area. If the X-ray results are inconclusive, however, they can use an MRI to produce a clearer image of the suspected fracture. Plus, our open MRI technology offers many improvements over the equipment traditionally used in MRI scans. Whereas a traditional closed unit machine enclosed the patient in a small space, our open MRI machine features a wide, rotating table that will not leave patients feeling claustrophobic. The layout of our open MRI scanner is also better suited for larger patients who might have had trouble fitting inside a closed machine. If you would like to know more about the open MRI technology that Tahoe Fracture & Orthopedic Medical Clinic is offering to patients in the Reno, NV, area, please call us today. We would happy to answer your questions and provide you with additional information.